Palestinian people pass by the Damascus Gate and nearby market area in East Jerusalem. 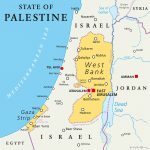 The relationship between the U.S. and Palestine has been fraught since the establishment of the State of Israel in 1948. Most of the time, the U.S. has come down on the side of Israel when there’s a decision to be made about who to support between the Israelis and Palestinians. That said, the U.S. government has a history of setting aside foreign aid money for the Palestinians in the West Bank and Gaza—not a lot, mind you, but we’re still talking in the hundreds of millions of dollars. It’s still a mere pittance in comparison to President Obama’s foreign aid package for Israel that included $38 billion in military aid over the 10 years between 2016 and 2026. The Trump administration isn’t satisfied with providing even $200 million to Palestine and has announced that it is redirecting that money to higher priority projects. 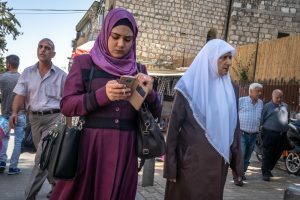 This comes in the wake of January cuts to funding for a UN agency that aids Palestinian refugees and a more recent decision not to spend money set aside by Congress to help stabilize areas in Syria. The timing of the administration’s decision not to spend money earmarked for humanitarian relief for Palestine—just weeks before the end of the fiscal year—means that Congress cannot reverse the decision. Following the defeat of the Ottoman Empire in World War I, the British government assumed control over Palestine. In 1917, the Balfour Declaration announced Britain’s intent to facilitate the “establishment in Palestine of a national home for the Jewish people.” Five years later, the League of Nations granted Britain a mandate over Palestine that included creating a Jewish homeland and then facilitating Jewish immigration and encouraging Jewish settlement on the land. At the end of World War II, Britain still controlled Palestine, but in 1947 they realized that they could no longer manage the nation—thus, they turned the issue over to the United Nations. On November 29, 1947, the UN recommended the partition of Palestine into two states—one Jewish state and one Arab state. The Jews accepted the UN resolution, but the Arabs rejected it. The British mandate over Palestine officially terminated on May 14, 1948, at midnight. Earlier that day, Zionist leader David Ben-Gurion proclaimed the creation of the State of Israel and became its first prime minister. The next day, the U.S. recognized the State of Israel, and the Soviet Union did so a short time later. The thing about foreign aid that many do not realize is that it is actually a form of defense spending. The Trump administration sees providing aid to Palestine as supporting Hamas because the terrorist organization has governing authority there. But by providing foreign aid dollars for humanitarian assistance in Palestine, the U.S. would actually be making it harder for groups like Hamas to recruit members. Without that aid, Hamas actually stands to gain more power, not less. What does this all mean? A spokesman for the Israeli Embassy in Washington, D.C. told the New York Times that Israel had no reaction to the cuts, although it has historically supported decisions by the Trump administration to cut aid to Palestine. Although political and embassy staff were reticent to express their feelings about the Trump administration’s lack of aid to Palestine, lobbying groups certainly were not.